Holy Zarquon! What's that over there on the left? Could it be - gasp - a new review?! A review of the UK Region 2 Hulk DVD? Surely not! Click on the sleeve image, or here to read the review. A very happy Hallowe'en to you. I hope you'll be watching something appropriate this evening! Hong Kong Legends has announced their lineup for the first quarter of 2004. January sees the release of Chow Yun-fat's comedy action movie Tiger on the Beat (which co-stars Kill Bill's master sword-maker Gordon Liu). Iron Monkey will be re-released as a Platinum Edition in February (hmmm, not if New Line have any say in the matter!) The disc will have a new commentary track by star Donnie Yen (with assist from esteemed Hong Kong movies authority Bey Logan), and will come with a second disc containing new interviews and features. Two titles are due in March: Sammo Hung's 1990 Bruce Lee tribute Skinny Tiger Fatty Dragon, and Jackie Chan's 1983 comedy Winners and Sinners. 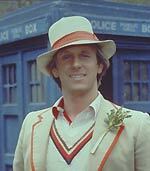 Another Doctor Who DVD has been semi-officially announced by the BBC: the 1982 Peter Davison adventure The Visitation, an excellent story set in 1666, featuring Coronation Street's John Savident. The single-disc release is tentatively scheduled for January the 24th. An article about the restoration work is available at the Doctor Who Restoration Team website. The disc will feature an isolated score track, a cast and director commentary track, three featurettes, focusing on the directing, writing and the music, and a production information subtitle track. Another Doctor Who story is known to be on the schedule for 2004: the 1974 Tom Baker story Pyramids of Mars, which won Doctor Who Magazine's poll as the story the fans most want to see on DVD. It's a blue ribbon day for fans of silent cinema! 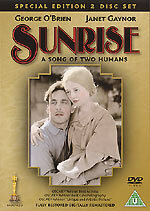 Eureka Video will release F.W.Murnau's Oscar-winning masterpiece Sunrise as a two-disc special edition on January 26th 2004. The 1927 film (sometimes known as Sunrise - A Song of Two Humans), which Cahiers du Cinéma called "the single greatest masterwork in the history of the cinema", will feature a choice of mono Movietone score and effects track, or an alternate stereo score. Bonus materials include a documentary, by film historian R. Dixon Smith; the original English intertitle cards; a commentary track by ASC cinematographer John Bailey (American Gigolo, Mishima, etc); outtakes with optional commentary; the original scenario by Carl Mayer, with Murnau's handwritten annotations; a stills gallery; the original theatrical trailer and restoration notes. The set has an RRP of £22.95. 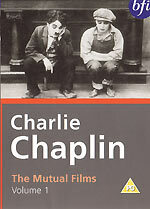 BFI Video will release a collection of films that Charlie Chaplin made for the Mutual company on November the 17th, titled Charlie Chaplin - The Mutual Films Volume 1. The films, made during Chaplin's year-long contract with the studio, in 1916 and 1917, have been restored from the best available materials, and feature brand new scores written by acclaimed silent film composer Carl Davis (Ben Hur, Hollywood, etc). The disc will feature six short films: Behind The Screen, The Rink, Easy Street, The Cure, The Immigrant and The Adventurer. Bonus materials include newsreel footage of Chaplin on a return visit to the UK; an interview with Carl Davis; biographies of Chaplin's leading lady Edna Purviance and co-star Eric Campbell; and an essay on Chaplin's stint at Mutual, by Frank Scheide. The disc has an RRP of £19.99. The release coincides with a weekend of Chaplin screenings with live accompaniment by the London Philharmonic Orchestra, which will take place at the Royal Festival Hall, between Friday the 28th and Sunday the 30th of November. Each performance will include one of the Mutual shorts, followed by one of Chaplin's feature-length films: The Cure with City Lights, The Adventurer with The Circus and The Immigrant with The Kid. More details can be found here. 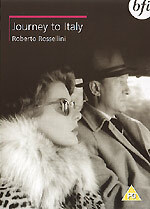 Roberto Rossellini's compelling study of a disintegrating relationship Journey To Italy (Viaggio in Italia) is also being released by the BFI on November the 17th. The 1953 film, which stars Ingrid Bergman and George Sanders, will be supported by a commentary track by Laura Mulvey, Professor of Film Studies at Birkbeck, University of London, and a biography of Rossellini. The UK women's magazine Eve is currently giving away a free DVD with each issue. There's a choice of two titles, one of which is Sandra Goldbacher's BAFTA-nominated 2001 movie Me Without You, which stars Michelle Williams and Anna Friel. The UK DVD is several minutes longer than the US version. (The UK disc also includes a commentary track by Goldbacher, and is presented in the correct aspect ratio, too). Some interesting notes about the differences between the two versions were recently contributed to the Home Theater Forum, and their author, Brian Gaddis, has kindly given me permission to host the information here. Here is the pack artwork for the two Clint Eastwood Collection DVD box sets, which are now due on the 24th of November. 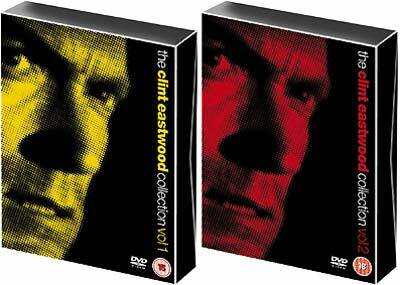 As previously reported, the box sets will include seven Eastwood movies that are making their UK DVD debut. All the films will have new widescreen transfers, and 5.1 Dolby Digital audio. Each box will have an RRP of £49.99. The Clint Eastwood Collection Volume 1 will include the eagerly-awaited Where Eagles Dare (which is accompanied by an On Location featurette), White Hunter, Black Heart, Heartbreak Ridge, City Heat and Pink Cadillac. The Clint Eastwood Collection Volume 2 will contain Tightrope, The Rookie, Honkytonk Man, Firefox (with a 25 minute Eastwood Director featurette) and A Perfect World. All the films will be accompanied by an Eastwood Film Highlights featurette and theatrical trailers. The competition for the Fireball XL5 box set has closed, and the winner is Duncan T. Congratulations to him, and my thanks to Carlton Visual Entertainment, who provided the prize. The answer to the question "Which of these famous TV series was also created by Gerry Anderson?" was Thunderbirds.